Ultimate Combo is back at Pepper Lunch! What better deal than two of your favourite dishes paired with sides and ice cold drinks at only $29.90 (U.P $45.60)? 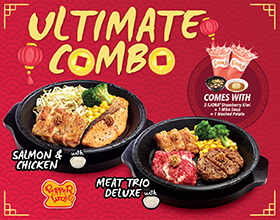 Each combo comes with 1 Meat Trio Deluxe and 1 Salmon & Chicken dish, with 1 Miso Soup, 1 Mashed Potato and 2 SJORA® Strawberry Kiwi! Available from 24 January 2019 for a limited period only.